With only a couple of weeks to go, I’ve been feverishly getting things ready for the reopening. Not sure if you are excited… but I am! Just wanted to run a few things by all you, my loyal fans. When the Pub reopens we will be moving to a Monday, Wednesday, and Friday posting schedule. I’ve finally figured out a way to read the strips chronologically. Check it out here. Comments can be viewed and left by clicking on the “Comments” link located below and right of each strip. If you see something missing or have a suggestion… let me hear it. Now… spread the word. Tell your friends, family, enemies, forum buddies, FaceBook Friends, Twits (is that what a Twitter follower is called? 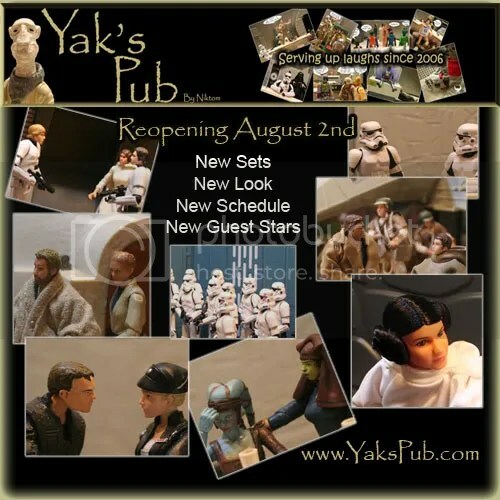 ), and anyone else you can find that Yak’s Pub will be back on August 2nd. Woo-hoo! Love the new layout! And we can go through the comics chronologically now! Score! OI’ff you’ll excuse me, I have a bunch of old comics to read through again! Yay!! Good to hear you will be back with the comics! I love them and check them every other day. Any layout will be fine, as long as you maintain your good sense of humor. Good luck with cooking up new jokes and scetches! Sadly, I can’t make it to CV… That’s one our in-service weeks leading up to the start of the school year. When I click on your name, Niktom, at the start of your post in the comments section, it takes me to a Japanese site at http://www.niktom.com. What’s up with that? LOL… yea, I stopped paying for that domain a while back apparently some Japanese folks were sitting back waiting for it to become available. Guess I need to update my profile. Looks great, I can’t wait! Nice to see you are going to a more sane publishing schedule (MWF). I was always amazed that you could keep up the daily grind. My boys and I cannot wait for the new Yak’s Pub! Yay!